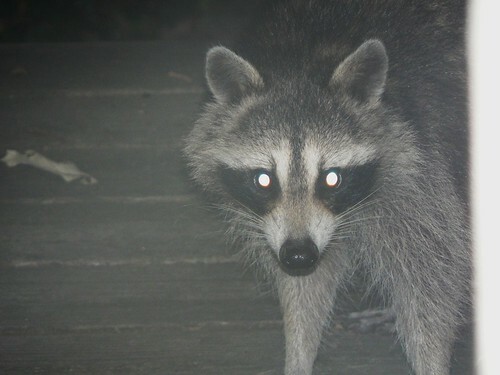 A couple nights ago we had a visit from a raccoon on our back porch. We have a bird feeder in the back yard, and the birds spill the seeds, attracting all kinds of animals. I’m sure it doesn’t help that we feed Emily, a neighborhood cat, right outside the back door. It was hard to take a picture of the fellow because I couldn’t see him through the camera’s viewer (because of the woodsy darkness), but I got a couple shots of him–especially after he climbed up on the porch and walked right up to me at the back door. In the picture below, I think maybe he was a little too close. The camera couldn’t even focus on him. 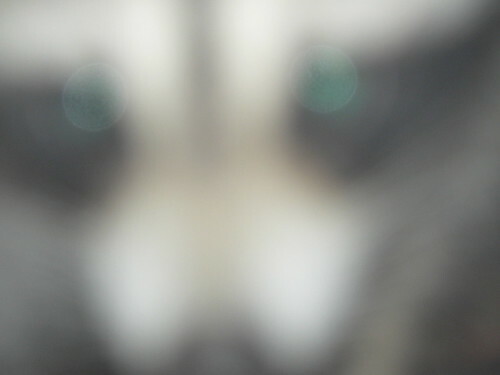 Are you sure it’s not a grey fox with black eyes? Maybe he got in the face of the wrong alpha-fox? Wow dude, you and your sophisticated jokes!